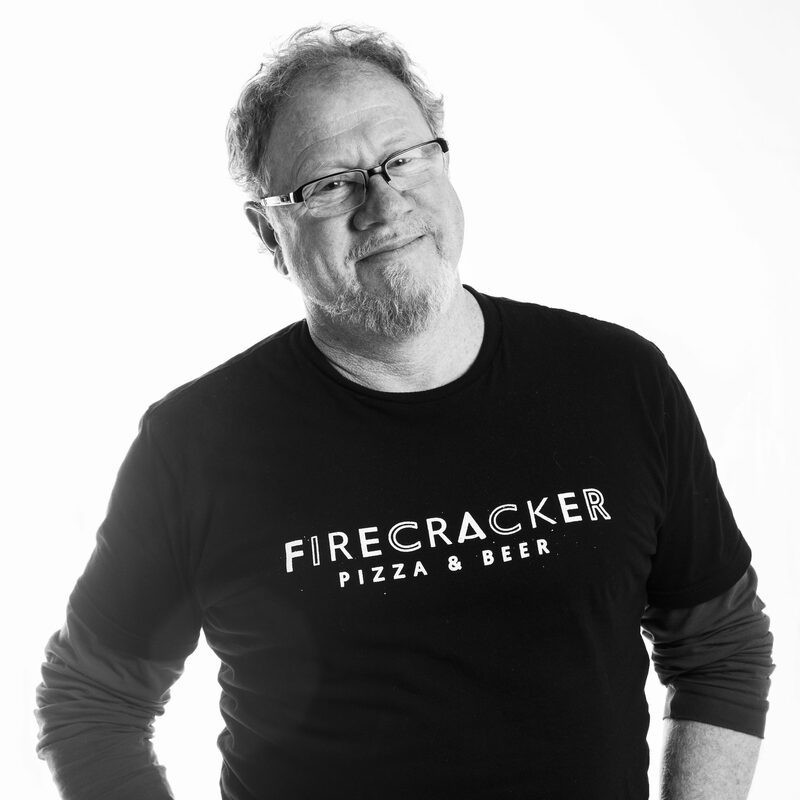 Chip Schloss is owner-impresario of Atomic Cowboy and Firecracker Pizza & Beer. After many years in the nightclub business, he saw the grand opening of his second venture as an opportunity to help reduce the restaurant industry’s waste by implementing environmentally friendly practices from day one. Restaurants that emphasize green dining see benefits like lower overhead costs and more popularity with diners. However, many owners aren’t sure where to start. We sat down with Chip to talk about his approach at his restaurants and to solicit advice for fellow restaurateurs. Chip Schloss owns and operates Atomic Cowboy and Firecracker Pizza & Beer, both located in The Grove neighborhood in St. Louis. Can you tell me about your team’s approach to providing a green dining experience at Firecracker? Chip: I’ll start with my favorite recycling approach — to not recycle anything. At Atomic Cowboy, every night at three in the morning we dump many, many 55-gallon trash bags full of cans and bottles into a dumpster. Granted, we do recycle, but there’s a lot of human error in that process. Sometimes they go in the wrong dumpster, and then there are statistics that say the recycling system is not as efficient as it could be. At Firecracker, we endeavor to eliminate those issues completely because when you have 66 taps that all come in kegs, there’s no can or bottle in the delivery. The kegs go back, they get refilled with more beer, and there’s no waste in that process. Glasses are washed and reused so nothing gets thrown out. Firecracker has a total of 66 beer taps and zero cans or bottles. I imagine one of the biggest concerns for restaurant owners is customer backlash. Was that a concern of yours? Chip: I think having taps works in our favor — not only from the recycling point of view, but as far as beer enthusiasts are concerned, they prefer draft beer anyway. 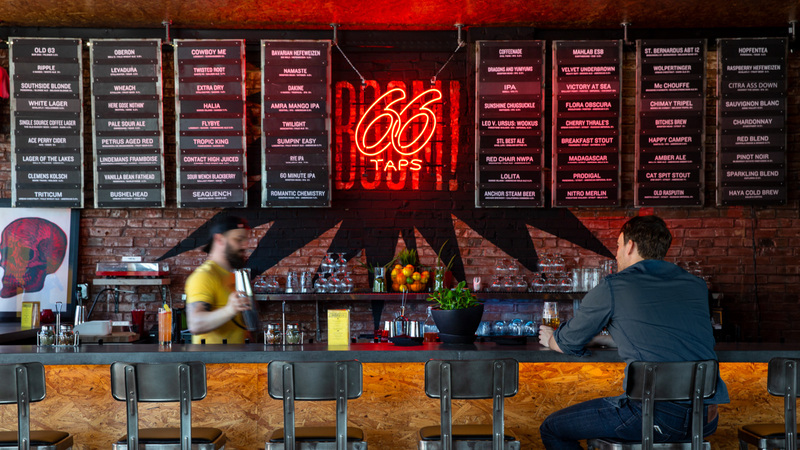 We have 66 taps and a lot of restaurants only have eight or maybe 12 taps, so we’re able to represent all the beer styles and do it at a level that meets beer enthusiasts’ standards. What inspired you to pursue green dining at Firecracker? Chip: I think it was just learning and seeing the inefficiencies and the wastefulness of the vast, high-volume nightclub concert business over at Atomic Cowboy. It’s hard once you entrench processes and methods that people get accustomed to. I hoped with a new venture that we’d be able to bypass all of that and start doing it from the very beginning in a way that addressed a lot of the issues, like not using the best recycling practices. Here at Firecracker, we opened up without anything plastic. Instead of Styrofoam containers, diners take home leftovers in boxes made from recycled materials. What advice would you give to a current bar or restaurant owner who wants to practice green dining at their establishment? Chip: I think there are some obvious things you can do that are pretty easy. Nowadays, it’s much more acceptable to eliminate straws. The business of manufacturing commodity items — paper goods, takeout containers, and things of that nature — has gotten much more sophisticated. It used to be so much more expensive and cost-prohibitive to purchase compostable items and even if they were affordable, they were sort of substandard in terms of quality. It’s so much more advanced now that it’s really easy for a restaurant to get rid of plastic straws, plastic bags, and Styrofoam. Lastly, I guess the other easy piece is composting food waste. Are you composting food waste at Firecracker? Chip: Yeah! Total Organics Recycling provides a yellow bin. I have my staff trained to throw food scraps into it and it’s super easy to do. It’s so simple to just empty that into the bin and they [Total Organics Recycling] come get it. They were referred to us by the Green Dining Alliance. 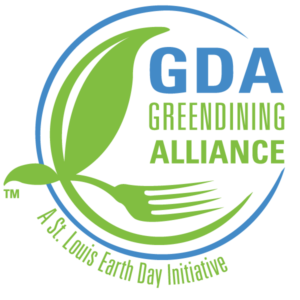 What are the benefits of working with the Green Dining Alliance? Chip: They come in and do an audit and give you a lot of advice in terms of guidelines. They make suggestions for things you can do that range from the easiest, low hanging kind of no-brainers to the more sophisticated stuff. Actually, Firecracker was the first restaurant in St. Louis to ever achieve certification by the Green Dining Alliance before we even opened our doors. Firecracker worked closely with the Green Dining Alliance to establish guidelines for sustainability before opening. Does your commitment to green dining affect the vendors you choose to work with? Chip: Not really. I think it’s become so expected in the industry that even traditional, broad-line distributors have started to carry products with that in mind. Food suppliers are very aware that restaurant owners want locally sourced goods wherever possible and organic, cage-free, and grass-fed options are now expected. The suppliers are pretty involved and active. 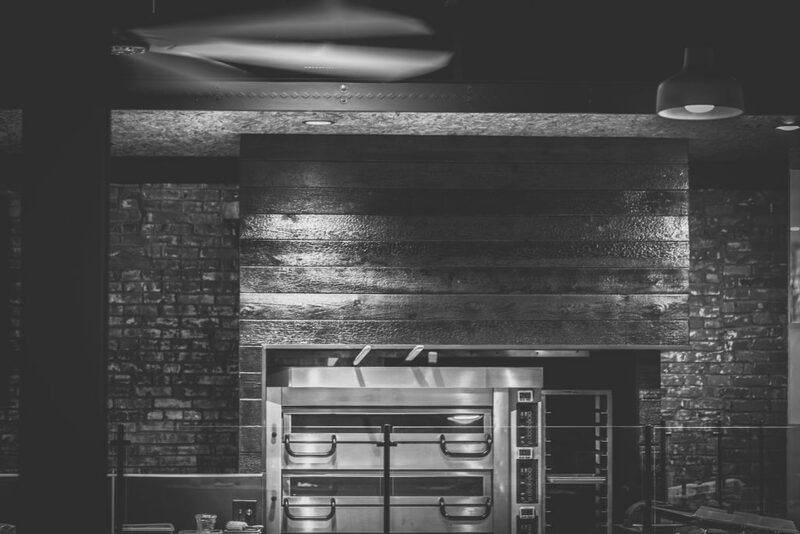 One thing that sets Firecracker apart from a lot of pizza joints is your energy-efficient electric oven, as opposed to a wood-burning oven. Can you tell me about that decision? Chip: I really rejected the trend of wood-burning ovens because of how much carbon they dump into the atmosphere. Even one wood-burning oven seems to add something that’s contrary to a good sustainability program. Also, it’s really difficult to source wood and you constantly have to keep a fire burning — you can’t turn it off at night and back on in the morning. The electric oven doesn’t need a lot of energy to get up to the right temperature and because it’s a multi-deck, we can turn decks off and get off the grid if we’re not busy. It’s trendy to be a wood-burning pizza place, but we went away from that because it’s much greener to have an efficient oven that doesn’t burn a natural resource. 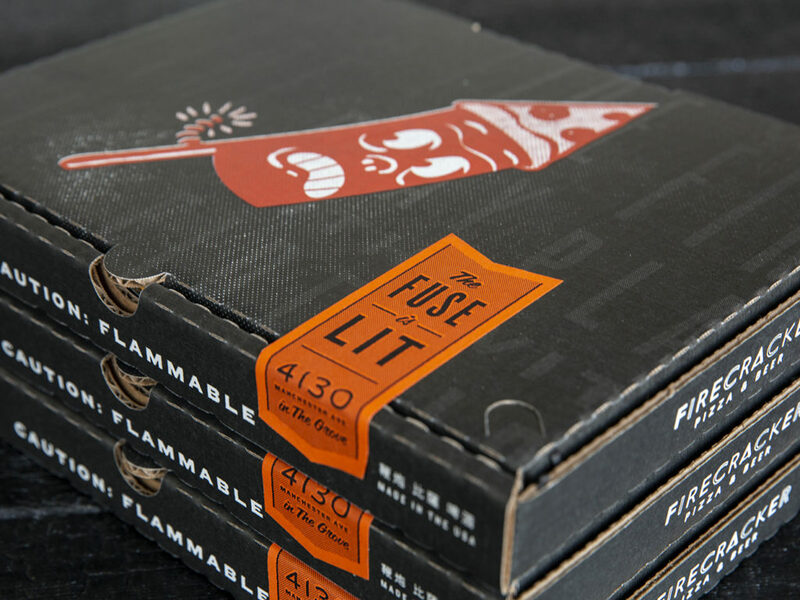 Firecracker has a custom-built electric pizza oven that allows for fast cooking times and energy efficiency. Do you think Firecracker staff appreciates the commitment to green dining? Chip: Yes, I think there’s a feel-good aspect to it, working for a company that clearly is making it a priority. I think people resonate with that — both people that work here and people that come here. A lot of really great companies are doing similar things, and I think there’s a lot of public awareness now. Maybe it’s a mark against those who aren’t working as hard to do anything. Straws have been in the news a lot lately — what do you think the next trend will be in green dining? Chip: I think with restaurants it’s mostly waste of food containers. Things that are non-reusable, like cans, bottles, packaging, and bags. Then we start getting into things like chemicals for your dishwashers and things that you clean with. Chemicals are probably more sophisticated and that’s an area that is a bit more cost-prohibitive for an owner to try to maintain a program of biodegradables, and things of that nature. You can visit Firecracker Pizza & Beer at 4130 Manchester Avenue in St. Louis (Atomic Cowboy is across the street). To see TOKY’s work for Firecracker, check out the case study here.